The Canadian flag can be hung high and proud this evening for Canadian female cyclists. 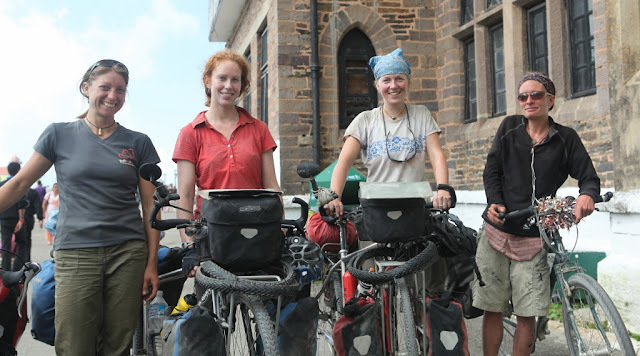 7000 miles (11000 km) from home, 5 Canadian cyclists meet by chance in a church court yard in Shimla, India. We immediate say hello and decide to meet for dinner for some good curry and a spicy conversation. Melissa Yule and Kate Harris are on a bicycle tour of border areas researching conservation areas. Their website cyclingsilk.com, highlights their 10 month pedaling excursion through Central Asia, Tibet, Nepal and Northern India. They have also shared their findings in a cool interactive website for geography teachers and students, www.reachtheworld.org. A friend, Hana Boyle joined them in Nepal for the final stage of their cycling and research journey. Robin Mackay also attends our table. Robin is an experienced international bicycle tourist and has been cycling solo in Northern India for the last month. I round out our table, on the road longest but WOW am blown away by the stories we all have to share at this wonderful table of woman on wheels (WOW). How Do You Handle All The Attention? All 5 of us in attendance had been told numerous times that camping in our tents or pedaling over that mountain pass was impossible. The local men discouraged us and insisted we all take local transportation due to the fact that it was too dangerous. Melissa, Kate and I have all fallen for this at least once. I took a truck ride in a mountain pass that the locals insisted was full of snow, I jumped out after 10km when I realized it wasn’t snowing but only raining a little. 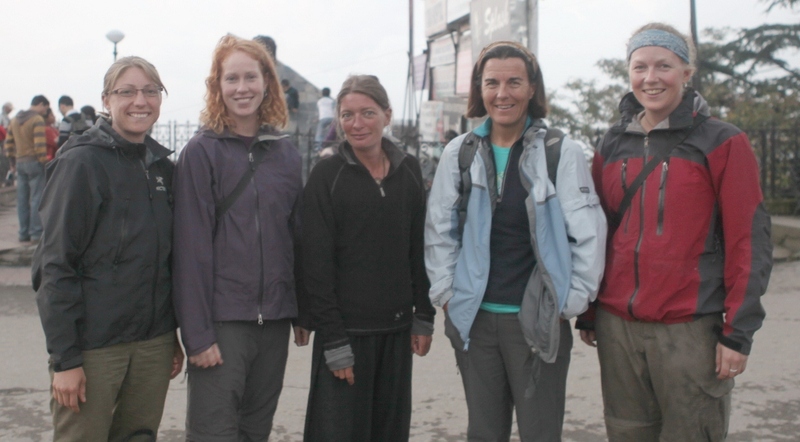 Melissa and Kate took a bus for a short jaunt in Nepal because some local men said they were in extreme danger. Seems the local guys are a wee bit protective of us foreign women and may not realize that we get to the top like the rest of the guys pedaling the Indian Himalaya this year. We all laughed at ourselves and said we would never fall for that one ever again! How Many Hours A Day Do You Ride? Melissa, Kate and Hana spend 4-5 hours in the saddle a day, either in the morning or the afternoon; sometimes they spread it out throughout the day. Robin usually finishes by noon when the weather is coolest regardless of distance. I have a tendency to just ride all day regardless of the weather, about 100km, sometimes more sometimes less. Robin and I were the only two pedaling solo. Unfortunately, Robin had been groped while getting a cold drink in a shop while pedaling towards Dharamasala and another similar insistent occurred in an internet café. Robin is not the first woman I have met in India who has had a local man grab her bum or crouch. However, the young man who groped Robin did not fair too well. In fact, he may of gotten some sense shock into him, literally. In both incidents, Robin grabbed the guys by their collars and made herself perfectly clear that doing that is not acceptable. You go girl! What Are You Going To Do When You Get Home? Kate will be expanding cyclingsilk.com and writing a book about the bicycle adventure and their research. Melissa has a boyfriend and a move from Ottawa to look forward to. Robin meets her husband tomorrow at the airport and will continue pedaling with her him throughout India. Hana originally from Whitehorse, returns home to Vancouver after pedaling the India Himalaya to a new job as an indigenous rights lawyer. And me? Well, I will continue to raise awareness concerning bicycle ambulances and sell charity t-shirts as I pedal back to Pakistan, Iran, Turkey and into Africa. 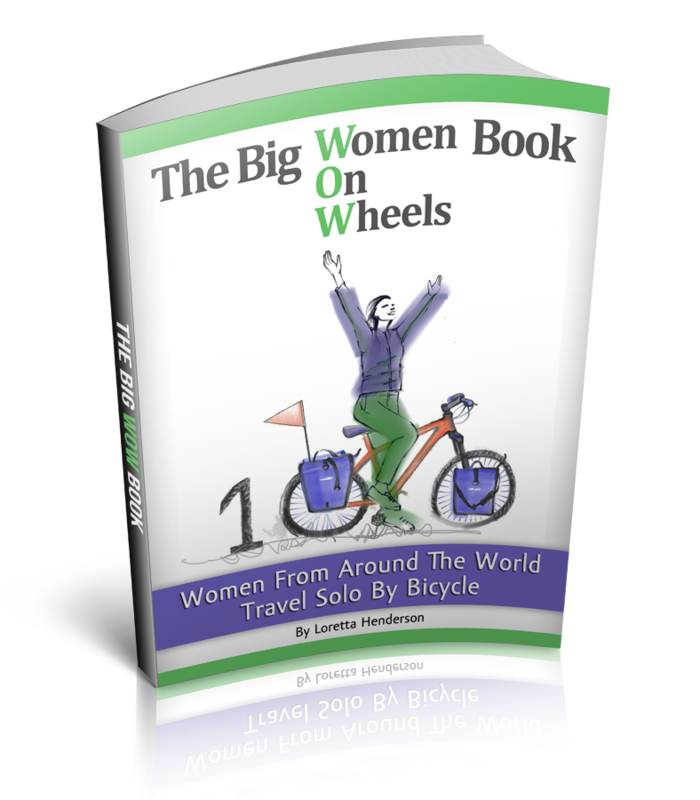 I hope, I will meet these remarkable (WOW) women on wheels again someday, perhaps, back in Canada for some Indian curry.